Daylight savings was last week, but I’m still mourning the loss of our hour of daytime. 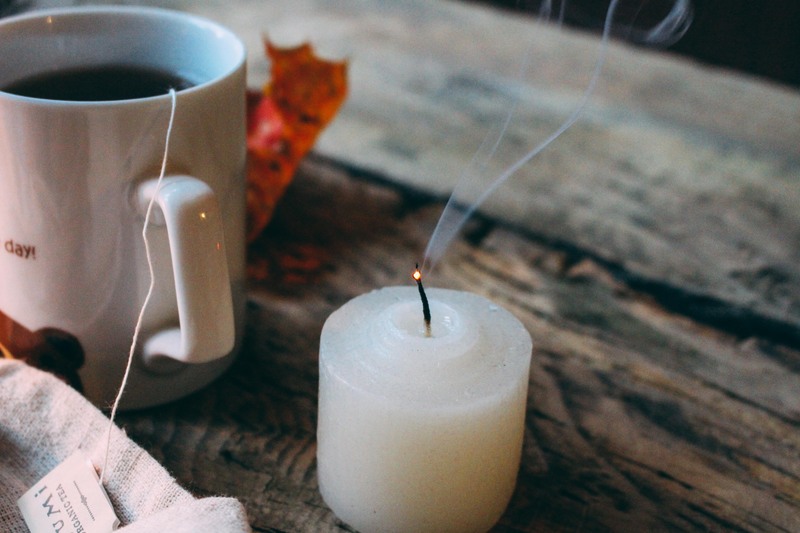 The days got so cold and so dark, so fast, and those red cups just popped out of nowhere (who else is disappointed with the lack of design??) and the thought of winter now is very, very real. But to me it’s all about summer still, and we’re planning for them now, putting in our preferences for where we’d like to be sent off for our rotations. Of course I’d like to stay within the lower mainland (the most cost-effective choice), but I wouldn’t mind if I got sent somewhere random either. Make life an adventure, why not. There’s so many small towns in BC that are unheard of to me, and there’s not really a reason to visit either unless it was for something specific, like our rotations. Planning is a funny thing. Intention is also a funny thing. It’s like some vague outline or representation of who you think you should be or the person you think you are, but actually executing everything is another story. I have some things on my to-do lists that I’d like myself to accomplish and see through, but sometimes it’ll take me a while, or sometimes enough time will pass so that I’ll rationalize to myself why I don’t need to do it anymore. I don’t know. How about you? What’s stopping you from doing what you want? Or what you think you want? 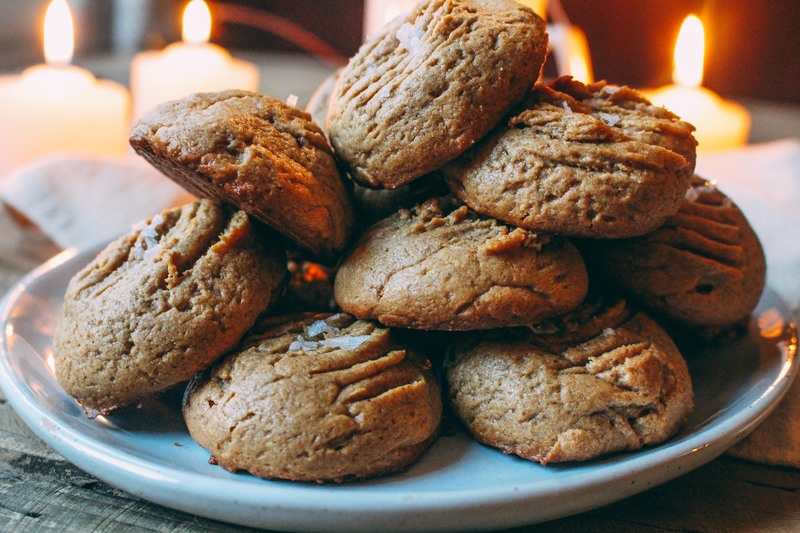 These cookies are salted peanut butter cookies, which happen to be gluten free. They’re stupid simple to make and come together, start to finish, in under an hour. 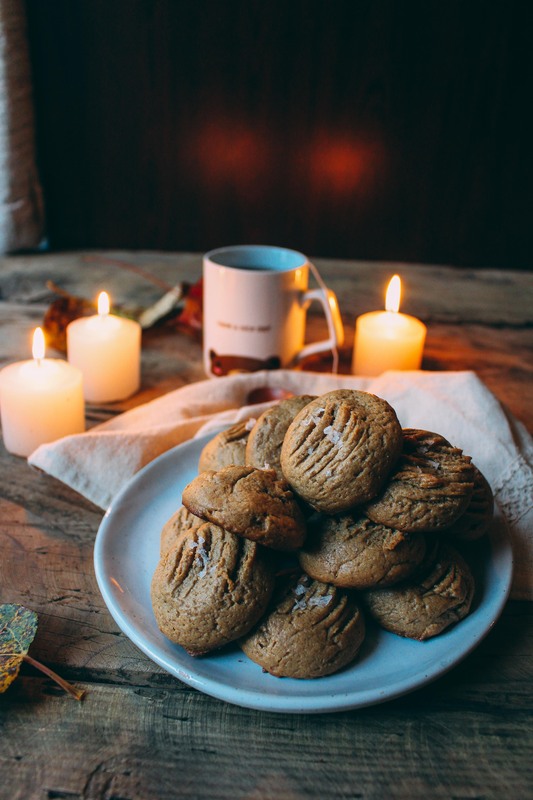 The recipe comes from Ovenly, a dreamy bakery located in Brooklyn, NY, famous for their chocolate chip cookies (which happen to be vegan), as well as these salted pb cookies. 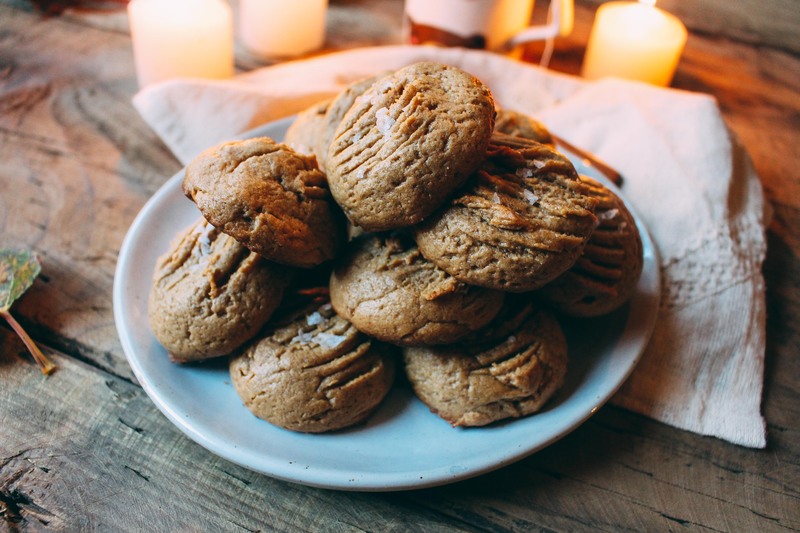 Even though the recipe is deceptively simple, it’s everything a peanut butter cookie should be– fragrant, peanutty, rich, dense, chewy, sticks-to-the-roof-of-the-mouth, sweet and salty goodness. 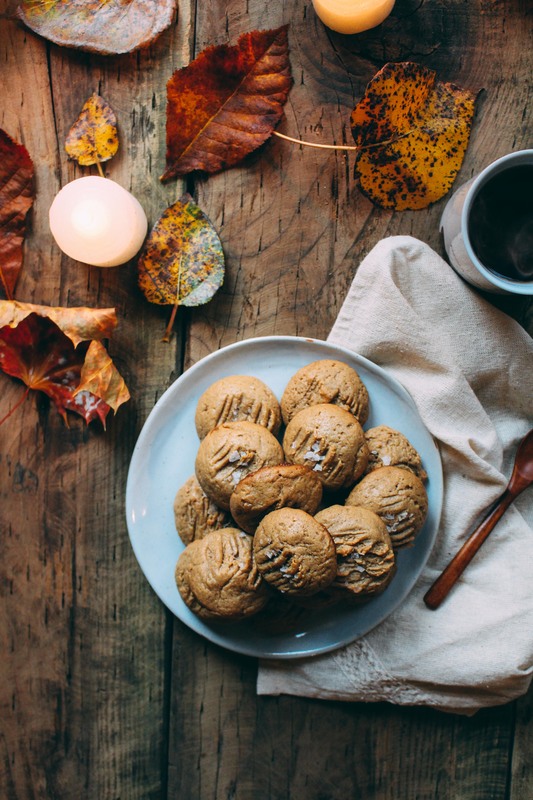 So go on, bake these cookies, make a cuppa tea, and take a break before continuing to knock off things in the huge to-do list we call life. 1. Preheat the oven to 350°F. Line a rimmed sheet pan with parchment paper. 2. In a medium bowl, vigorously whisk together the light brown sugar and eggs until incorporated. Whisk in the vanilla extract. Add the peanut butter and mix with a spatula until smooth and completely incorporated, and until no ribbons of peanut butter can be seen. You know the dough is ready when it has the consistency of Play-Doh. 3. Using a scoop or a spoon, form the dough into 12 approximately 2-inch (2- to 2 1/4-ounce) balls and place them on the prepared rimmed sheet pan. For smaller cookies, use a heaping tablespoon. 4. Sprinkle the dough balls lightly with coarse-grained sea salt just before baking. If baking 12 large cookies, bake for 20 to 22 minutes, turning the rimmed sheet pan once halfway through baking. 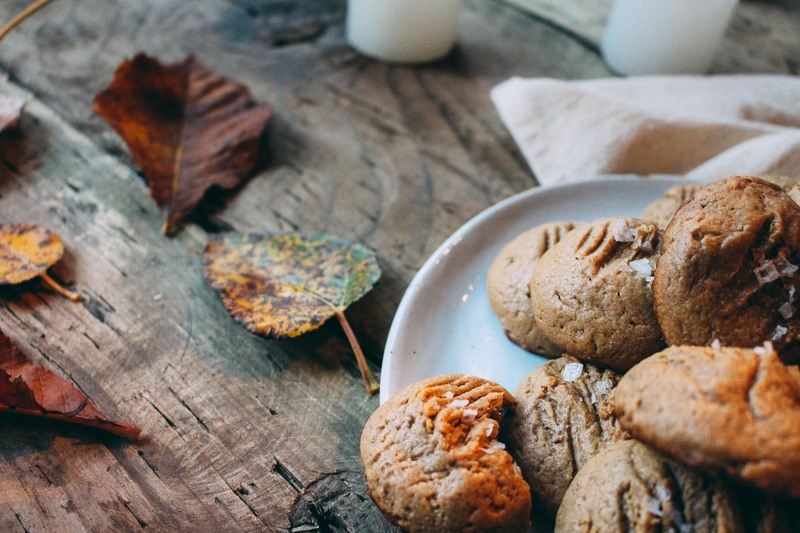 For 18-20 smaller cookies, bake for 16 to 18 minutes. (Mine was perfect at 16 minutes). When finished, the cookies will be lightly golden and cracked on top. Let cool completely before serving. 5. 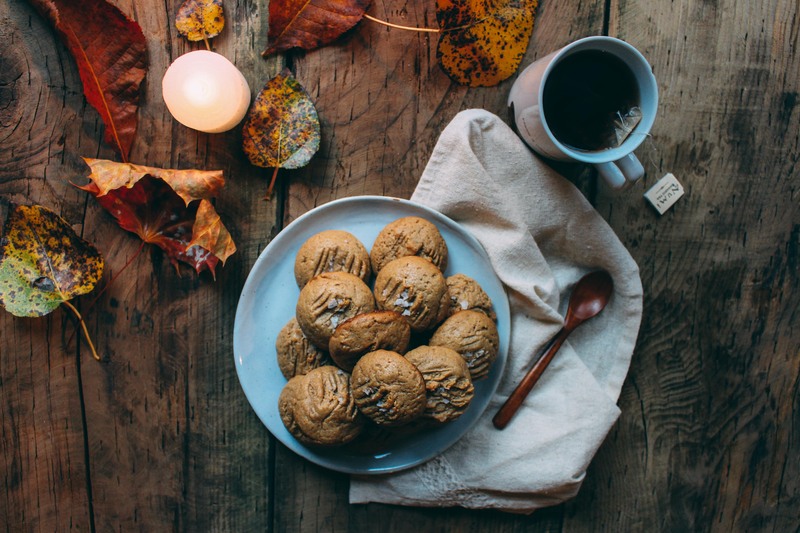 You can bake these cookies as soon as the dough is prepared, but they will retain their shape better if you freeze them for 15 minutes before baking. Because I didn’t have an ice cream scoop, I put them into silicon 1.5-inch demi-molds and froze them for 15 minutes, but I’m sure most of you would have an ice cream scoop before demi molds, haha.